In 1988, Jackie Stewart was testing one of Tom Walkinshaw's Jaguar XJR9 racers at Silverstone as part of a series of track tests being carried out by the three times World Champion. 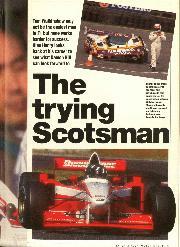 Stewart had completed barely two laps in the powerful machine when he dropped it over the kerb at the exit of Woodcote. For all his skill, Stewart was unable to stop the Jaguar being written off in a £200,000 impact. Understandably, Walkinshaw accepted Stewart's apology with a stoic good grace tinged with a degree of exasperation. With that episode in mind, it is not surprising that the F1 fraternity is gleefully anticipating a furious battle between the two motivated Scots when they launch their own Grand Prix teams in 1997. Yet while the force of Stewart's business acumen is spiced by his own Formula One experiences, Walkinshaw's is a calculated business approach, regarding his £6 million purchase of the Arrows team as a technical showcase for his own TWR automotive empire. With that in mind, the 50-year old is aiming to build Arrows into a winning force in time for the 1997 World Championship. He is intolerant of failure and deeply committed to success, although like Stewart, he is seeking around £20 million of commercial sponsorship to underpin his ambitions. There is a core of steel beneath the surface of Walkinshaw's personality. Not a man to be trifled with, Walkinshaw now presides over an automotive development group which operates on four continents. Think TWR and you are talking in terms of the Jaguar XJ220, Aston Martin DB7 and the new Volvo coupe which took this year's Paris Motor Show by storm. 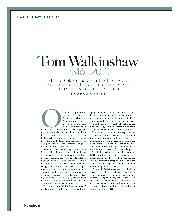 Dynamic, driven and highly focused, it is hardly surprising that Walkinshaw is a millionaire, many times over. He is also the man who left F1 reeling and wrong-footed when he signed Damon Hill to drive in 1997; he has brought together the new World Champion, Bridgestone and Yamaha to form a tantalising technical package for the future. "We are not doing this for fun, we are doing it to create a team capable of winning Grands Prix," he explained, "and I think we should have that by next year. That is one of the advantages of going the Arrows route, enabling us this year to prepare the team to win, or at least be in the top three. TWR's main business is obviously in the motor industry and engineering in the automotive sector. That's our first priority, but our technology is displayed by our racing teams and F1 is vital to us as a marketing tool. We don't see it as a profit centre, it's a performance centre for the entire TWR group." 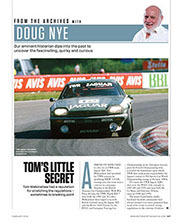 In 1982 Tom Walkinshaw Racing began a partnership with Jaguar which developed their 5.3-litre XJS coupe to the point where Walkinshaw won the European Touring Car Championship. 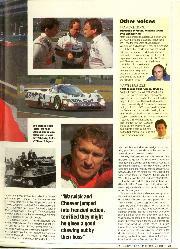 Encouraged, in 1985 Jaguar gave the green light for Walkinshaw to make a Le Mans winner. 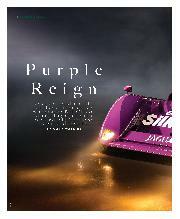 What followed was an intensive three-year programme of technology development which saw TWR raise the tempo of sports car racing with a succession of superbly engineered XJR coupes. In 1986 they won a single race, the Silverstone 6-hours, in 1987 TWR won the championship with eight wins out of ten and in 1988 added Le Mans to the tally. 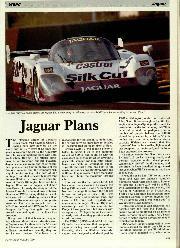 TWR won the World Sportscar Championship for Jaguar in 1987, '88 and '91. In the process, Jaguar's rather staid commercial image received a massive promotional boost which was reflected by an upsurge in showroom sales. The first time I saw Tom Walkinshaw, he was extricating himself from an F3 Lotus 59 which he'd contrived to flip onto its rollover bar at Snetterton in early 1970. From that moment, it was clear he was a tough customer. He was also a man who tended not to share thoughts with his colleagues. 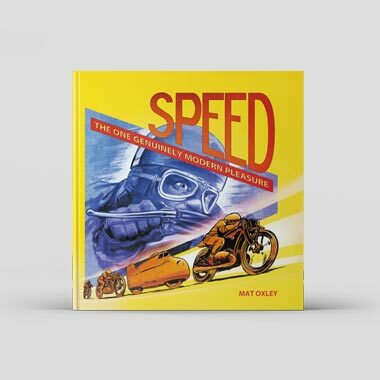 Even if Tom's early single-seater racing career was not marked by obvious success, you felt he was going to make a mark in the sport. He radiated physical strength and determination like a convector heater. Born in 1946, Walkinshaw came from a farming family near Prestonpans, on the banks of the Firth of Forth. He cut his competition teeth in Formula Ford single-seaters, winning the 1969 Scottish Championship at the wheel of a Hawke. In 1970, after his initial foray with the Lotus, he signed for Petonyer Team March, the semi-works wing of the famous Bicester-based race car constructors. 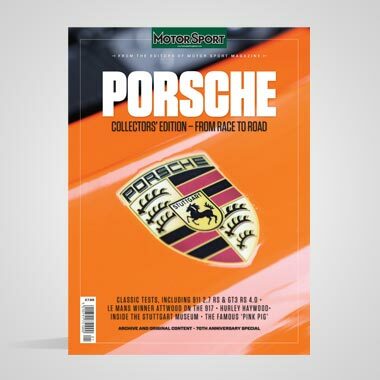 Petonyer Team March was managed by Andrew Marriott who later became Assistant Editor of MOTOR SPORT after initially leaving its sister publication Motoring News to try team management. I was fortunate enough to fill the vacancy Marriott has created at MN only to blunder into print with naive comments about Walkinshaw's shortcomings as a racing driver. To say that Tom was unamused was like saying that the Titanic is damp. Violence was averted by a hair's breadth, but it was a salutory experience on my part. Walkinshaw had more important things to concern himself than the rambling of a wet-behind-the-ears racing hack. After struggling hard with the hopeless March 703, his efforts were rewarded with two broken ankles when he somersaulted the wretched device during practice for a race at Brands Hatch. This sidelined him for the rest of the season, but he returned to the cockpit in 1971 when he graduated to Formula 2 at the wheel of an Ecurie Ecosse-entered March 712. He achieved little success in another ill-starred season punctuated by a serious road accident and in 1972 his career took one more wrong-turn when he became involved with the now-defunct GRD operation. 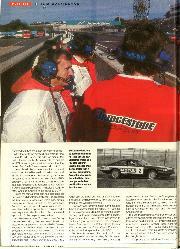 Tom then made the switch to saloon cars and forged a fruitful relationship with Ford as a works-backed Capri racer. This lasted through to 1976 when he switched his allegiance to BMW. During the same period, Tom had capitalised on his testing and development abilities. His reputation in this sphere grew to the point where many private owners were only too willing to pay the Scot a daily fee to sort out their own saloon racing machines. It was clear he had a special flair in this area and it was only a short step from this to the commercial application for his preparation expertise. In 1976 he established Tom Walkinshaw Racing on an estate at Kidlington where one of his first projects was to prepare a run of special BMW 6-series coupes for BMW Great Britain. On the circuit, that season saw Walkinshaw achieve one of his most significant victories, sharing a BMW CSL coupe with John Fitzpatrick to win the Silverstone 6-hour endurance race. 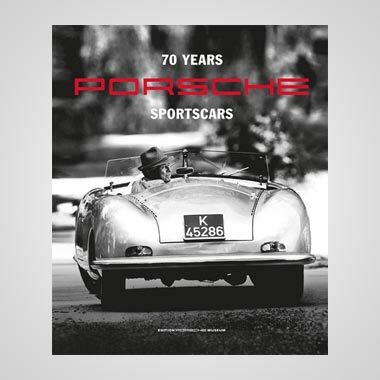 It was a dramatically close finish, which saw the British duo fend off the Porsche of Hans Heyer and Bob Wollek by little more than the length of the Woodcote chicane. However, Walkinshaw's motor racing activities have not always ended so happily. In 1983, his Rover saloons were disqualified from the British Touring Car Championship series after a lengthy legal debate. Later, an ill-starred partnership to start a string of car dealerships the Silverstone Motor Group with the British Racing Drivers' Club, who own the British Grand Prix circuit, collapsed amidst legal acrimony in 1992. The breach between this bastion of motor racing tradition and the thrusting Scottish entrepreneur is, to this day, only slowly mending. Nevertheless, it was Walkinshaw's engineering expertise which enabled the Benetton team to raise the standard of its game, laying the solid foundations from which Michael Schumacher was able to win both of the 1994 and '95 World Championships. Through this partnership, Walkinshaw was also offered the opportunity to purchase the rival Ligier team which was bought in 1994 by Benetton tear chief Flavio Briatore. However, these plans fell through and, early in '96, TWR pulled out its key staff from the French team in order to concentrate on raising the level of the Arrows team which he had bought instead. It is popularly assumed within the motorsport fraternity that Walkinshaw is an absolute dictator within the TWR domain. Yet his empire now embraces three sites in the UK, plus one each in Sweden, Australia and the USA and operations in Brazil, Indonesia and Japan. By 1996 a total of 1300 people worked directly for TWR worldwide. You don't operate on that scale without knowing how to delegate to the right people. The inspired decision to hire Hill, however, was entirely Walkinshaw's. Frank Williams has not had the best car in Formula One for five years simply thanks to his designers and engine supplier: it has also had perhaps the best test and development driver of them all on his books. To Walkinshaw, with a new team and a new car to develop, Hill's talent in this area and his knowledge of the operating practices and standards of the best team in the business will be near priceless. 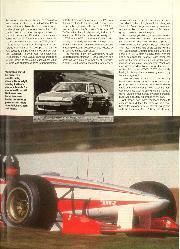 For Hill, Walkinshaw was clearly the best of the available longshots. While Stewart lacks the experience and Jordan seems to have reached a performance plateau, Walkinshaw clearly has the experience and the infrastructure to succeed. Do not also discount the potential of the Bridgestone tyres which look like handing the 36-year-old World Champion the best wild card of next year. How he will find life with Walkinshaw is a different matter. 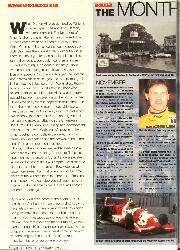 Many tough racing drivers and motoring journalists have been known to tremble under his dour gaze. One such episode is well remembers by retired F1 ace Derek Warwick. 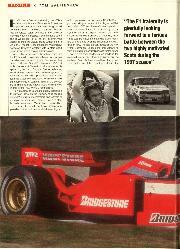 He and his American co-driver Eddie Cheever were horsing around in the TWR motorhome at one Jaguar sports car race in 1986, believing Walkinshaw to be away at another event. The place was festooned with fireproof overalls, thermal underwear and other racing detritus when the door flew open and Walkinshaw appeared on the step. He glanced round the room with a thunderous expression, then announced he would return in a few moments. In those fleeting seconds, Warwick and Cheever jumped into frenzied action, tidying up the debris, terrified that they might be given a good chewing out by their boss. Hill will not yet know how they felt. Jackie Stewart might have an idea.